We are incredibly proud of what our children have achieved. We continue to teach our Projects (integrated learning), ensuring that the curriculum is rich and varied, right up to the point that children sit the national tests (SATs). During this time, we do prepare our children for the statutory tests, which take place in May, so that they become familiar with routines and expectations. Protecting children from the pressures of these tests are a priority for us. Our staff care deeply for the children and ensuring that they learn how to Care, Learn, Enjoy, Achieve and Reflect remains at the centre of what they do. We greatly value the support of our parents and family members, and it is this home-school partnership that helps our children be successful, to the best of their abilities. Foxhills Junior school has continued to improve the learning experiences of children. 2016 saw the introduction of the new SATs test. While our outcomes were still above the National standard, we recognised that we needed to better prepare our children for the format of the tests and, as the 2017 outcomes show, we successfully addressed this. 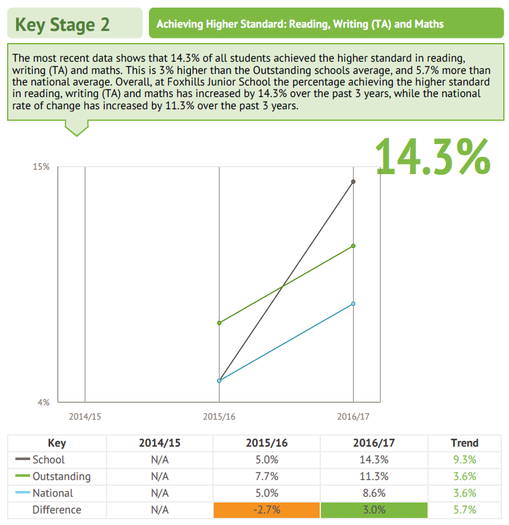 In 2017, the performance of Foxhills Junior School was greater than National standards and those of schools recognised (by ofsted) as being 'Outstanding'. We continue to evaluate and develop our practice, year on year. Progress is measured from Key stage 1 to Key stage 2. In KS1 Reading, Writing and Maths are all teacher assessed. In KS2, Reading and Mathematics standards are measured through tests. Writing is purely assessed by teachers. In 2017, whilst we followed the statutory marking guidance, we applied some of the technical criteria, (e.g. spelling) too, when compared to other schools. The Department for Education has since issued guidance to schools that technical errors, alone, should not impact on the writing outcome. Instead, a more significant measure is the composition of the child's writing and the effect it has on the reader. We have taken this on board for 2018. 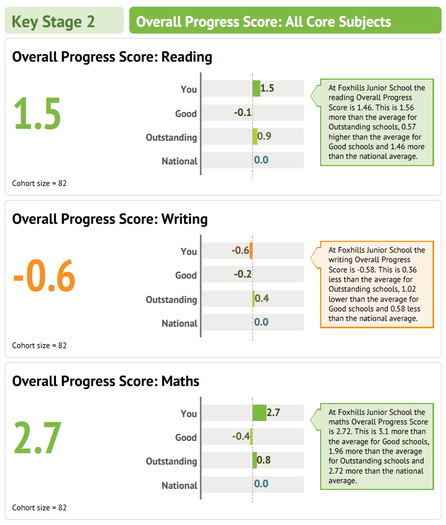 This table shows the scores children achieved in the standardised assessment tests (SATs). 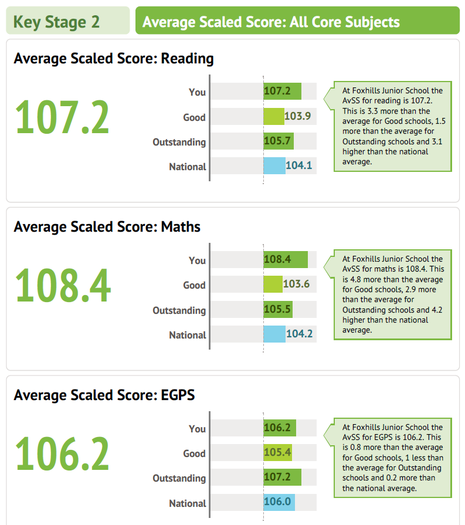 As detailed, the average scores were well above National standards and those of schools deemed (by ofsted) to be 'outstanding'.